Igloo Hostel is proud to be valued as Nottingham's most popular cheap budget accommodation for backpackers, tourists, students, schools and sports groups. ​This is the Igloo Backpackers Hostel blog. We post about things to do in Nottingham, music, videos… and probably some cat photos. Head down to Old Market Square this summer and you'll find Nottingham Beach... complete with a sandy beach, palm trees, a large paddling pool, rides, food and a 'beach bar' - you may even spot people snorkelling in the fountain! Annual summer event with food, stalls, activities, music and a wonderful chance to explore the gardens and find out about what’s going on locally. All welcome, free entry. Paloma Faith will be headlining Splendour’s 10 year anniversary party alongside other epic acts including The Charlatans, Marc Almond, The Stranglers and many more! The pride march starts just around the corner from Igloo Hybrid at Castle Gate, around 7000 usually walk through the city in support of LGBQT+ rights. There is live music and events celebrating Pride all over the city from 11am until all night long! Nottingham's first collaborative hip-hop festival. Connecting local creatives, brands and organisations to celebrate and showcase hip hop culture. What to expect: Traders, crafts, live performances, live art, food stalls, children's entertainment, open mic, music! FREE EVENT. The Igloo Hostel is proud to be valued as Nottingham's most popular cheap budget accommodation for backpackers, tourists, students, schools and sports groups. My name is Alexandra, I’m 20 and I’m French. I came in England to improve my English. I chose this option to be in touch with lots of people and of course because the concept is very nice: you have to work just 4hours/day and you’re accommodated. It’s funny and sporting, you clean bedrooms, bathrooms, and kitchens… you have to garden also. All tasks are very diversified. The rest of the time, you’re free, so you can visit, practise sports (Formula One, best gym ever), discover a new culture and new people. I didn’t choose Nottingham, the opportunity presented itself, but if I had to go back it’s obvious. The city isn’t big but it’s really cute and you have lots of good places to eat (all type of food: vegan, Korean, typical English…), to do shopping (charity markets, famous brands…). The life here isn’t expensive and I was really surprise to see how the city is safe. You can hanging out later and nobody troubles you. I stay here for 6 weeks. I share my room with 3 roommates. They aren’t French so it’s really interesting because I’m obliged to speak English with them. Igloo Hostel is the coolest place to stay, rooms are lovely and you have a kitchen, you can meet people and be more autonomous. It is situated 5min from the biggest shopping centre, the streets have lots of markets too and they close later. So, when would you like to come ?! The Wheee! family weekend is always special and this year is no exception. There will be lots of arts and craft activities plus outdoor theatre and dance performances to entertain family members of all ages. The fun will start at mid-day (although the luminarium will be open from 11am with the usual ticketed entry). *all events free with the exception of Daedalude Luminarium and indoor theatre performances. Save the Earth Cooperative are putting on their first Community Market in Sneinton, The event will highlight the importance of food education, tackling food waste, Social Chefs, Ethical Products & Crafts, Supporting local businesses, Artisans and crafts people. Dot to Dot - 24/05 @ venues all over Nottingham city centre! After I finished school last year, I've always wanted to spend some time working and travelling around the UK. But sometimes it's more difficult than you think to find a hostel which takes volunteers. Back in Germany, I spent ages in front of my laptop, writing E-mails to differnt hostels in the UK, but most of the time didn't even get an answer. That is why I was all the more happy to hear that I could volunteer at the Igloo Hostel in Nottingham. Many people ask me, why I came especially to Nottingham and didn't go to bigger places like London etc. But I want to use my time in the UK to explore smaller places, which maybe don't come to somebody's mind in the first place when thinking about the UK, because I believe there is so much more to discover in this country. And Nottingham is great! The work here at the hostel is quite easy, only four hours a day, which leaves a lot of freetime to discover the city and the sourroundings. I just completed my second week here and I've already seen a lot of beautiful places and met so many friendly people. Besides visiting Nottingham Castle and Wollaton Hall, I spend almost one whole day in the "Galleries of Justice" Museum and "City of Caves", which was very fascinating and a good opportunity to learn a lot about Great Britian's and Nottingham's history. While walking through the ancient caves and passageways, the tour guide of the "City of Caves" told us a lot about how the inhabitants of Nottingham lived and worked in those sandstone caves from the 11th century on. The caves where used even until the 1940's, mostly recunstructed as air raid shelters during the second world war. My favourite place I've visited so far is Newstead Abbey. Newstead Abbey is the ancestral home of the poet Lord Byron and a really beautiful big house with a lovely garden. To go there I took the train (Newstead is only to stops away from Nottingham) and then had to walk there for about 30 minutes. Even though (or just because) the weather was really bad (it was cold and it rained all the time; there was even some snow on the streets) I enjoyed the walk towards Newstead Abbey a lot. It was kind of adventurous to make my way through the flooded and muddy streets; and the advantage: I had the garden all for my own, because no one wanted to take a stroll at this weather except for me. But there are also smaller places in Nottingham like bars or cafes, which are nice to visit. 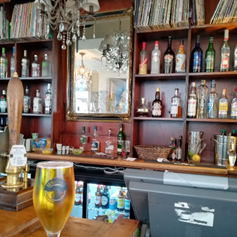 I enjoyed a Tuesday evening at The Bodega Social Bar tryintg to answer the challenging questions of the weekly Music Quiz and listened to funny and fascinating stories told by the "Storytellers of Nottingham" at the Malt Cross. So there is a lot to do in Nottingham and I can't wait to explore even more in the four weeks that are left of my volunteer experience at the Igloo Hostel. 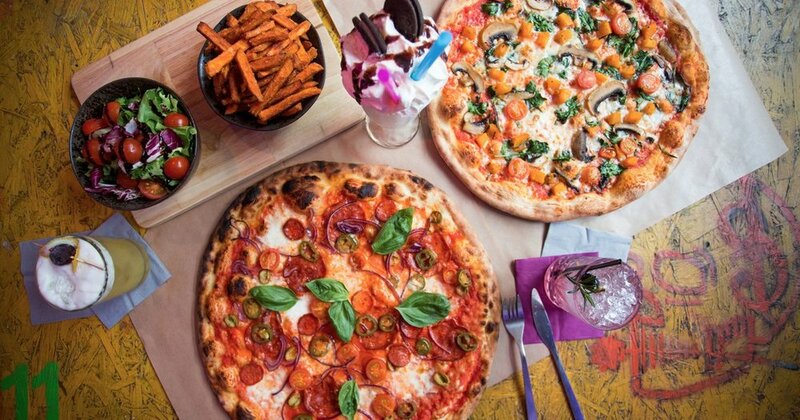 In celebration of the incredible amount of places to eat in Nottingham here is our first list of our favourite eateries.... this time pizza is on the menu and there are loads of joints that offer up a great slice. Join the Notts pizza party and head to one of the destinations below! Hand stretched sourdough pizzas. Signature pizzas include 'Pancetta, red onion, sweet chilli infused pineapple, parmesan, olive oil' and 'Roast aromatic duck, spring onion, cucumber, on a hoisin sauce base'. (YUM!) They've got plenty of veggie options too and have vegan cheese available. Once you've squeezed all that in they also do killer shakes like 'Rolo Banoffee: Nestlè Rolos, fresh & frozen banana blended with ice cream & topped with cream' ..drool. Build your own 12" for £7 or upgrade to a large for £3 more which includes all sauces and unlimited toppings. Every Tuesday and Wednesday it's 2-4-1 on ALL pizzas and for £12.50 on Thursday it's all you can eat. Check out their full menu here. So secret they don't have a website or anything but we found their Instagram, word on the street is they make a fine pizza. Catch them at the side of Rough Trade knocking up special daily flavours like 'Smoked Stilton with red wine and onion marmalade' and 'oak smoked crispy salmon skin with Sicilian preserved lemons, fresh chilli and flowering oregano'. All on a fresh sourdough base... get in my mouth! The original independent Notts pizza co. They've been making their delicious pizzas since 2013 and are legends on the local food scene. They've got their famous 14 inchers for £14, pizza by the metre and a banging vegan menu. Toppings include 'The Cosmopolitan' (serrano ham, tinned peaches and fresh basil leaves), 'The Checkpoint' (butternut squash roasted in cumin & chilli, award winning smoked streaky bacon and fresh sage).. or go for a vegan option like the 'Cheat Sweats' with vegan chicken, 'fakon', and vegan ham. As well as their pizzas they've got a killer mac n cheese menu, and great locally made desserts. Head over to their website to see the full menu, book tables and all that. Find "pizza innovator extraordinaire" Louis Louis at his residency at Das Kino. Find delicious and unique pizzas like the ' 'Three Amigo's'.. red peppers, red onion, jalapenos, nachos, sour cream and guacamole on a salsa base or 'Slumdog Millionaire'.. a tomato tikka base with chicken, raita, mango chutney and a mint yoghurt drizzle.. Vegan cheese and gluten free options available too. If you're looking for something sweet the Nutella Pizza is the way to go. If pizza isn't your thing (why?) there are massive burgers and sundaes too. Check out the menu here. Just a minute or so away from Igloo Hybrid, Mod Pizza serve up build your own pizzas with plenty of toppings and all kinds of cheese (including vegan options). There is loads of choice so we'd recommend checking out the options before you go otherwise you'll be stuck in the que for ages trying to decide (like we did) OR just get EVERYTHING on top.. here is the full list as well as some ideas from them. For £7 it's a bargain and they've got a great drinks machine as well. 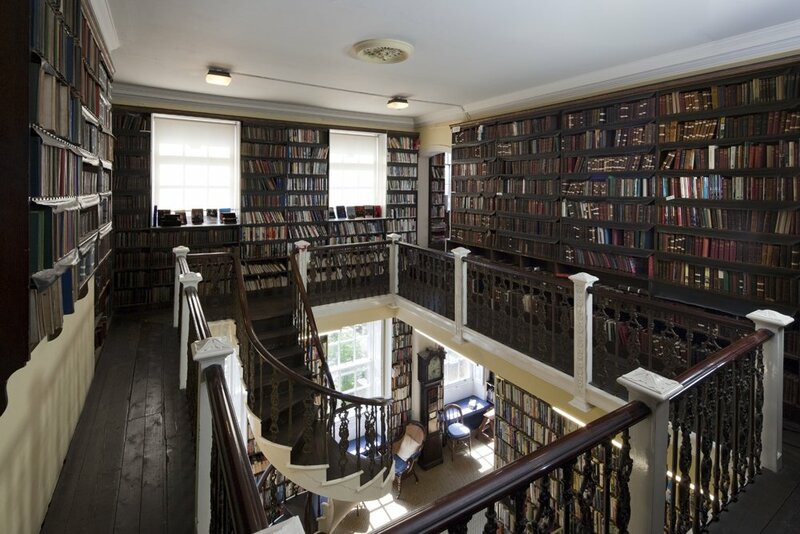 The most beautiful library in Nottingham! Usually only open to members but throughout the year they hold open tours which are really worth a visit, £2 per person. The Bell Inn has stood looking over Nottingham's Market Place since it was first built as a priory in the reign of Henry II. Through its doors have come the famous sons and daughters of Nottingham. Visitors including Oliver Cromwell, A famously well kept house especially by the Jackson family who had ownership for over 100 years. Come and explore behind the scenes where the guests rarely go and hear the stories that the staff tell each other! £15pp includes a drink. A celebration of independent labels within the city selling their wares under one roof. Join Robin Hood, his Merry Men and a whole host of colourful characters in this immersive experience and be transported back in time to 12th Century Nottingham. The Castle grounds are transformed into a medieval village encampment, complete with period cooking, traditional crafts, jesters, street theatre, music and puppet shows. Tickets: ad£12.00/ch£9.00/family £30.00 includes admission to castle. An iron man, giant birds, a diabolical Mr Punch, a treasured maiden and the talents behind the workings of the National Theatre’s War Horse will be featured in Nottingham’s first-ever Puppet Festival. Local, national and international artists, both upcoming and old-hands, will be bringing their talents and demonstrating their skills at locations across the city including the National Videogames Arcade, Nottingham Lakeside Arts, Broadway Cinema, Dance4 and Malt Cross Caves. 22-25/03. Free and ticketed events. 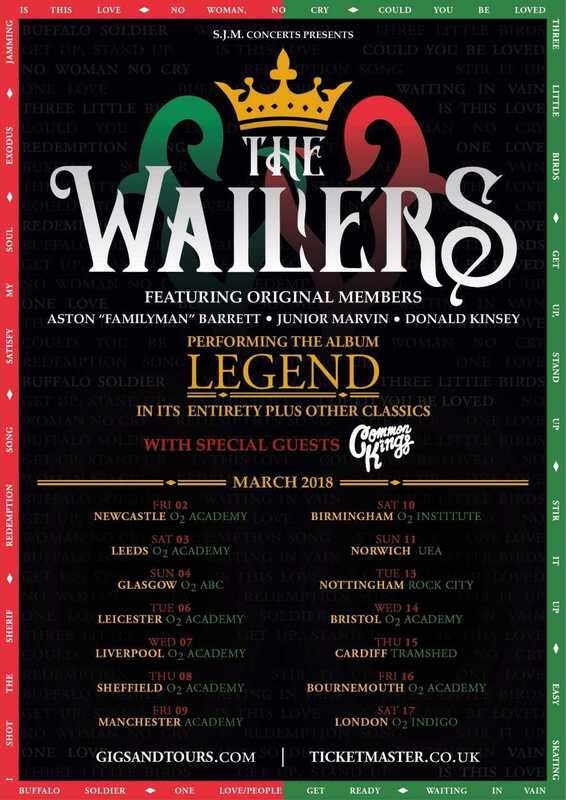 Bringing their revolutionary sound to fans around the world, the UK tour will see The Wailers play the iconic Legend album live on stage in its entirety, including its greatest hits Three Little Birds, I Shot the Sheriff, Jammin’, and many more. Fresh and rested, ready to tackle our last day in Berlin, we make our way by the S train to the Brandenburg Gate and Reichstag building (German Parliament building), stopping at Alexanderplatz on the way, but the weather is still horrible and we can barely stand being outside. We finally find a cute vegan Vietnamese restaurant (short walk away from the gate but Sarah cannot read a map on her phone either apparently…) where we wait in the warmth for a friend who lives in Berlin to join us. We have the best meal ever after which my friend takes us to the Jewish memorial, then the Museum Island, we walk around Mitte and sightsee in the much better weather by then. Attila who has been fascinated by the crosswalk signal on every traffic light pole has a ball when he finds out that someone made a brand out of these little guys and is actually selling hundreds of products with the green and red men on it. We then go inside Haus Schwarzenberg where not an inch of the several-story staircase is without graffiti and we take a moment to try and make out as many messages as possible. There are some very funny ones and even several “Go Vegan” ones that make us laugh. We walk around some more until the evening when my friend takes us to the East Side Gallery and a place closeby where what looks like abandoned warehouses are instead rehabilitated into restaurants, bars, clubs, a swimming pool, a bouldering and climbing place etc. All of them covered in graffiti if course. We then go to a cool bar where we are surprised to see almost everyone smokes inside. My friend explains to us that apparently in Berlin, many bars and clubs have found a way around the smoking ban where after a certain hour, if no hot food if served and there are no minors present, people are allowed to smoke inside. After the drink, my friend makes his way home and Attila and I start walking back to the hostel. That’s when I see it: a sign outside a small place on the street saying “Vegan Waffles”, which I’ve been pestering the guys with all day at this point. It is a sign, we HAVE TO go in and try it. Attila, more than full himself is not really impressed and remains in the cold, smoking but I go in and ask the guy behind the counter if the place is still open. He answers that it is and in fact, he just started making a new batter for waffles, which just proves this was meant to be and we have to try the waffle! But the wonder doesn’t stop there: his specialty is the Thai ice cream, which we have all seen videos of when street vendors pour liquid milk on top of fruits on a very cold tray and start stirring and shaking the liquid which then becomes solid ice cream. I am mesmerized by the process as I watch him make us a vegan strawberry-Oreo ice cream. We get to talking and we find out his name and how he came up with the name for his place: Delabuu Ice Cream. Let’s just say that there is French homework and his best friend playing a football game on TV involved. You’ll have to ask him yourself for the full story if you want to know! 😊 We left the igloo mark on the chalk board so have a look for it if you go. After the really good sweet treat, we finally make our way back for to the hostel. We checkout in the morning and make our way to the airport after getting delicious Vegan breakfast wraps and smoothies from a place at the station. We make our way to the gate and board the very crowded aircraft back to Nottingham where we get the Skylink Express bus back to the city center for even cheaper than before as the driver sells us two tickets for just £10. The Vegans in Berlin, Attila and Sarah. As you may know already, the staff of Igloo is made of people from all over the world (well, Europe really!) who love travelling and discovering new places, new people. This January, two of us, Attila and Sarah, went on a quick trip to Berlin to test if it is indeed the European capital of Veganism and now we want to share our adventure with you. Why Berlin, you ask? Well, RyanAir was doing round trip tickets for just £20 so we couldn’t pass on it, really. After a smooth, if not a little cold bus ride (the heating turned on around halfway through) we easily make it to the East Midlands Airport where the bus drops us in front of the departure terminal. One last quick cigarette for Attila and off we go. Well, we actually stop at the Leon restaurant for some coffee and tea (with plant milk of course!). Time is close to 6:00am and the gate has been announced so we make our way to the security area where not too many people are waiting at this time of the day. We quickly grab our belongings and go look for Gate 2, where people are already lining up for boarding. The plane isn’t full at all so we each end up on an empty exit row with extra leg room since they must have people there in case of an accident. Very roomy! After a less than 2-hour flight, we land in Berlin Schönefeld Airport where we quite easily find the train station (4min walk away from arrival terminal) and buy 2 single tickets into the city center for 3.40€ each. The train is super comfortable and fast and we get to Ostbahnhof train station, right next to the Hostel we booked in the cool and trendy Friedrichshain quarter. We don’t see any of the cool and trendy though, as we are blinded and numbed by the cold rainy snow that is storming down on us. Attila is already shooting me death glares for getting the crazy idea that Berlin might be fun to visit in the middle of winter… How was I supposed to know? Just a couple weeks ago the weather was above 12℃! 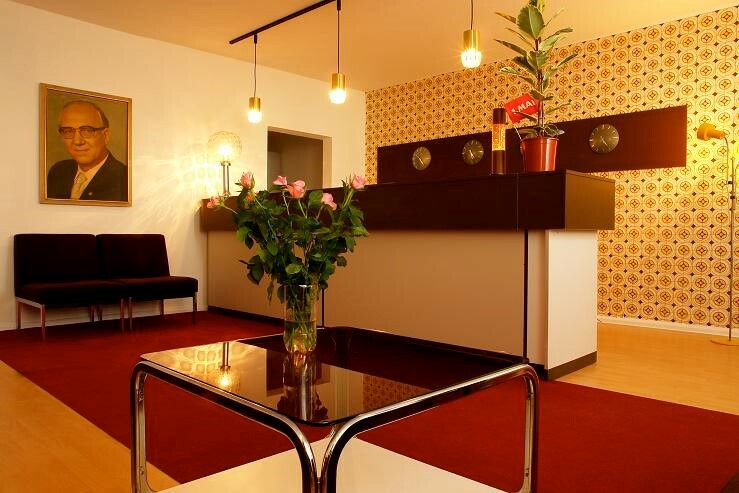 We quickly check into our cool hostel Das DDR OSTEL which looks frozen in the 1960s. We feel like two spies during the cold war. True to history, our room doesn’t have a TV but a huge radio with which Attila fiddles to get some Trans music, this is Germany after all, but only ends up with some mainstream tunes and a French channel, ha! 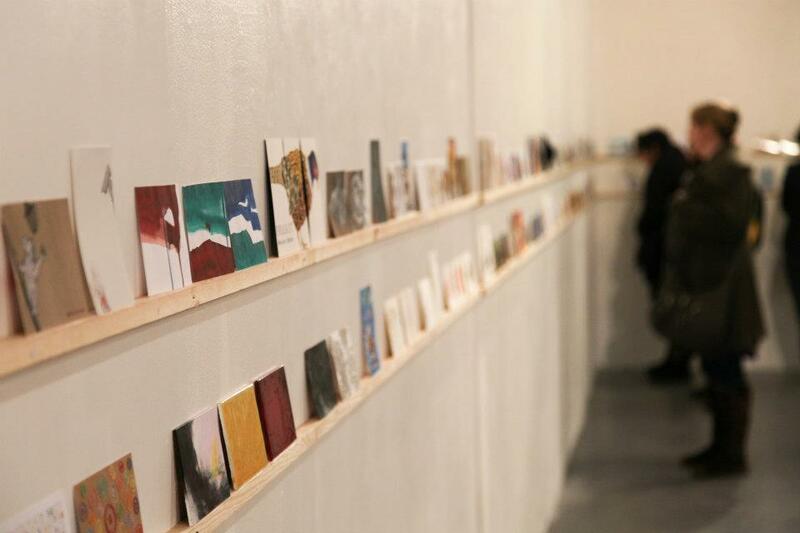 Surface Gallery welcomes back the International Postcard Show. This vibrant, long-running exhibition is a highly popular event which includes hundreds of original artworks from established and aspiring artists from all over the world. All submissions are included, from painting and print through to textiles and illustration, creating a wonderfully eclectic mix of artwork. All artwork is priced at £15, so this is a fantastic opportunity for visitors and aspiring art collectors to snap up an original work of art at an affordable price. Now, a decade on from the original Get Happy Tour, Bowling For Soup are delighted to announce The Get Happy Tour 2018! In bringing The Get Happy Tour back to the UK, Bowling For Soup have decided to give their fans what they've been asking for for many years. For the very first time, Bowling For Soup will perform their smash hit breakthrough album Drunk Enough To Dance in its entirety. A whole host of events are going on around the city to celebrate Chinese New Year. Including a Chinese New Year Temple Fair at Old Market Square, See and participate in activities which regularly feature as part of China’s New Year celebrations. There will be arts and crafts including calligraphy and paper cutting; storytelling, music and dance including the Chinese Dragon dance. Also, ample opportunities to try out some authentic Chinese New Year foods! Celebrations also include a photography exhibition, which is a great opportunity to explore Hemudu, an ancient town with over 7,000 years of history, in Ningbo. 96 photos will tell you the story of its fascinating and unique landscape, culture, heritage and development. 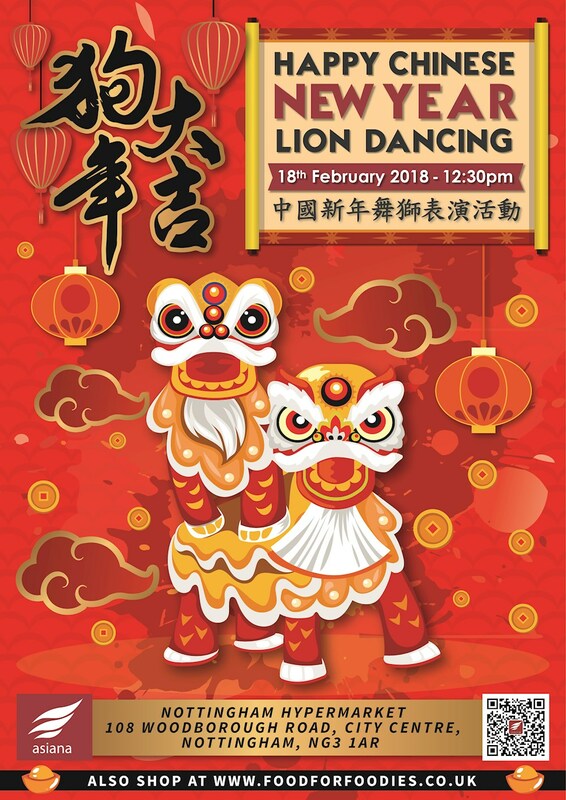 Later on in the month there is also a Lion Dancing event just around the corner from Igloo Annexe and Pods! It's pancake day! For £9.95 you can have UNLIMITED pancakes at The Lacehouse - advance tickets needed go HERE for more info and to book your hour long slot. One of Nottingham's annual highlights! See the city and various locations be turned into a light installation for one night only. The Nottingham Light Night festival transforms the city and brings it to life after dark through illuminations, spectacles, music, street theatre and much more. Check out LeftLion's top light night locations HERE! "Be amazed by spectacular visuals projected on iconic buildings like Nottingham Castle and the Council House that tell stories or depict moments in time. Let the kids (and kids at heart) bring out their inner Luke Skywalker as they fight off the Sheriff of Nottingham with light sabres while being guarded by the force of Robin Hood." Many events are free and for all the family to enjoy! Documenting all aspects of alternative lifestyles and sub-cultures, Alan has photographed many free and commercial events, environment protest, land rights demonstrations, and rave culture. Giving an insightful view that only people who have been accepted into a community can really achieve, his aim has been to present a more positive view of people and communities that are frequently misrepresented. Larks in Transit is a compendium of travellers’ tales and the general shenanigans of twenty years as a travelling comedian. With musical virtuosity, surreal tangents and trademark intelligence, Bill Bailey tackles politics, philosophy and the pursuit of happiness. Plus, he fashions a symphony from a ringtone, tells the real story of Old McDonald, and a re-imagines the Stars and Stripes. Two decades of touring larks from a comic described by the Daily Telegraph as ‘the brainiest comic of his generation’. 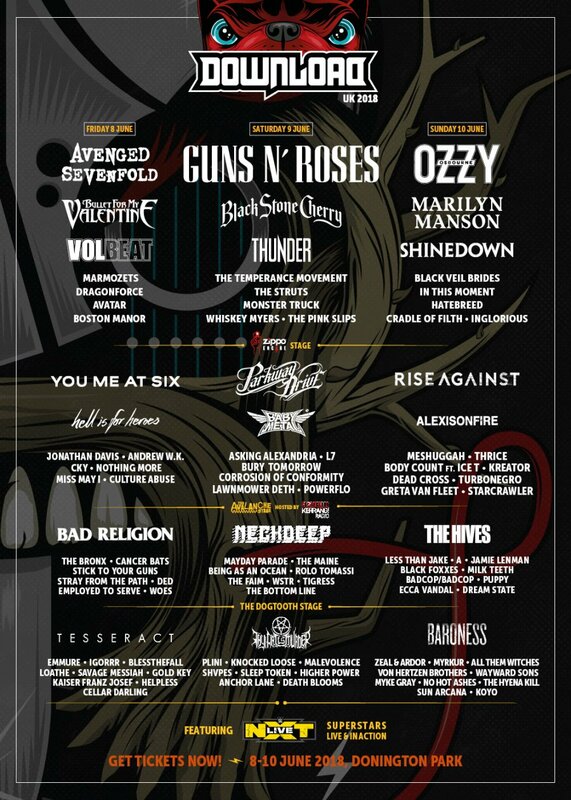 £28.50 tickets. The Igloo Backpackers Hostel and The Igloo Annexe are proud to be valued as Nottingham's most popular cheap budget accommodation for backpackers, tourists, students, schools and sports groups. We offer a wide arrangement of rooms (female dorm and mixed dorms, as well as private single, double, twin, triple, quad and family rooms) at budget prices. Both our buildings have self-catering kitchens and our staff is award winning friendly and always there to help you make the most of your visit to Nottingham. BOOK DIRECTLY WITH US AND WE'LL GIVE A PORTION OF YOUR BOOKING TO CHARITY! PS - Even if ‘the computer says no’ for what you are looking for, it's always a good idea to contact reception about what you need, our rooms are much more adaptable than what can be shown online. Igloo is run by humans after all, and we can often move things around and make adjustments to accommodate your booking. All of our buildings are advertised and maintained as quiet premises for the quiet traveller. We do not accept hen/stag or party groups in either of our properties. If you need to book a group bigger than 5 people, please contact reception to discuss your group.